HOUSTON (CNS) — Catholic and civic leaders in the Houston area recalled the late George H.W. Bush’s legacy as president, his history as a Houstonian and his faith as a Christian. 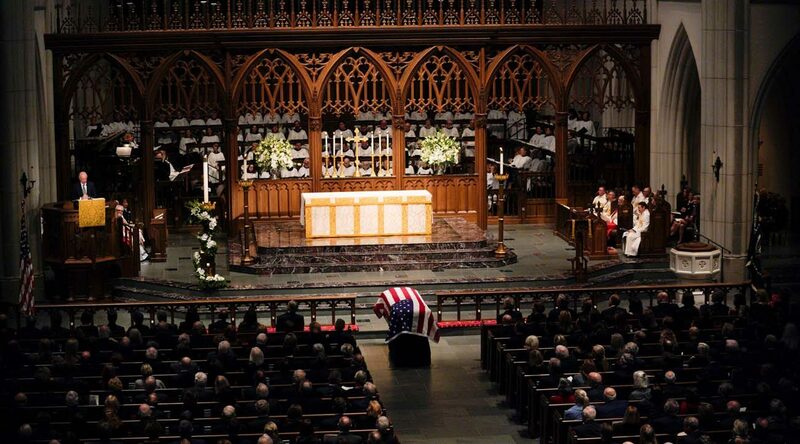 Cardinal DiNardo, head of the Texas archdiocese, said Bush’s career in the public eye — from the Lone Star State to the global stage — was marked by incredible statesmanship and honor. Cardinal DiNardo and his predecessor, retired Archbishop Joseph A. Fiorenza, sat in the front row at St. Martin’s Episcopal Church in Houston Dec. 6 for the funeral services for the late president. Bush and the first lady were “very religious people,” according to Archbishop Fiorenza, who began serving as bishop of what was then Galveston-Houston Diocese a few months after Bush was re-elected as vice president in 1984. When Barbara died in April, Archbishop Fiorenza noted the first lady’s tireless advocacy of literacy and said she had visited the archdiocese’s inner-city Catholic schools.